•	Load ranges from 350kg up to 775kg per wheel. 100mm diameter 85 shore A green ergonomic polyurethane tyred on an aluminium centred wheel with ball bearings. Tread width 50mm, bore 20mm, hub 56mm. Load capacity 350kg. 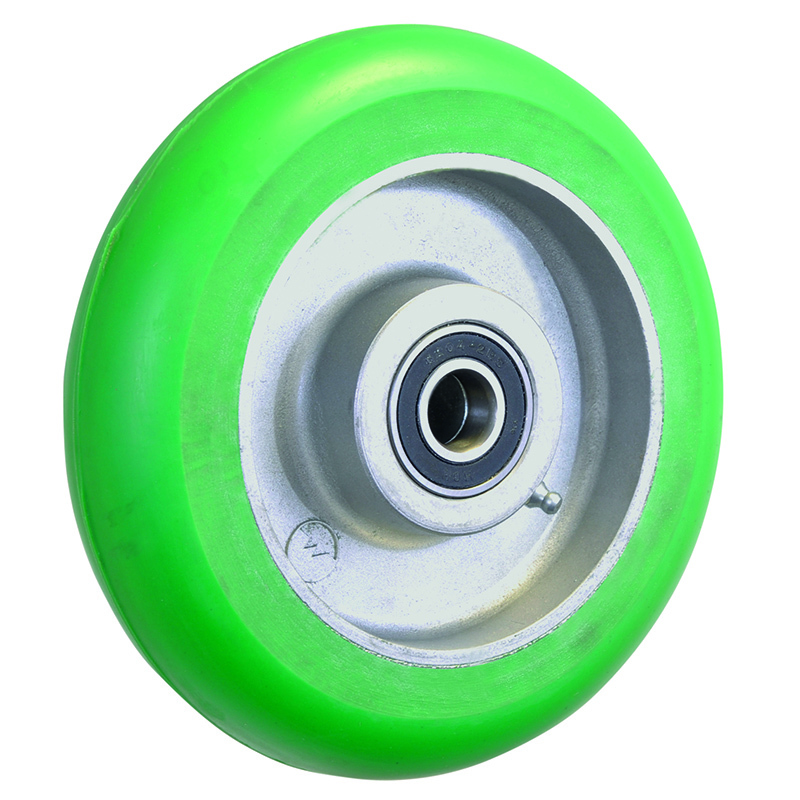 100mm diameter 85 shore A green ergonomic polyurethane tyred on an aluminium centred wheel with ball bearings. Tread width 50mm, bore 20mm, hub 50mm. Load capacity 350kg. 125mm diameter green 85 shore A ergonomic polyurethane tyred on an aluminium centred wheel with ball bearings. Tread width 50mm, bore 20mm, hub 56mm. Load capacity 450kg. 150mm diameter low tractive resistance green 85 shore A Ergonomic polyurethane tyred on an aluminium centred wheel with ball bearings. Tread width 50mm, bore 20mm, hub 56mm. Load capacity 575kg. 200mm diameter low tractive resistance green 85 shore A ergonomic polyurethane tyred on an aluminium centred wheel with ball bearings. Tread width 50mm, bore 20mm, hub 56mm. Load capacity 775kg. 200mm diameter low tractive resistance green 85 shore A ergonomic polyurethane tyred on an aluminium centred wheel with ball bearings. Tread width 50mm, bore 25mm, hub 56mm. Load capacity 775kg. 250mm diameter low tractive resistance green 85 shore A ergonomic polyurethane tyred on an aluminium centred wheel with ball bearings. Tread width 50mm, bore 20mm, hub 56mm. Load capacity 850kg.